And while it's still eighty something degrees outside here in Alabama, this time of year has me wishing for warm and cozy plaids. You can even add touches of Fall to your kitchen with those adorable mixing bowls and tray. The monogram mug would make a precious gift too, fill it with some goodies or hot chocolate mix and give it to someone special. No matter what you do, make sure to embrace the changing of the seasons. "I think God created the seasons as a gentle reminder that nothing in life is permanent: not joy, not pain, not friendship, and sometimes not even love." I love Target but I don't have one here at school. I am going to have to take a trip home to go see the new items they have for the fall. Your Target pics are great! I love Target's new plaid line! I am a huge fan of fall decor and cozy things and can't wait for it to start feeling a little cooler around these parts. Same here! I want to decorate for Fall so badly, but it's just way too hot out! 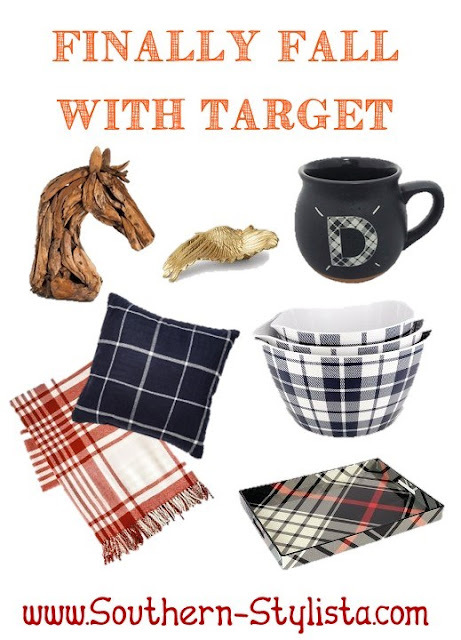 I am dying over the Target plaid collection! I've already made quite a dent in their selection..it's so pretty! It's so hard not to! I'll definitely be placing an order soon! We need to get our Target back here! I miss it in Canada. I love the scarf and that mug is so perfect! I wouldn't be able to make it without Target! Do they at least still ship to Canada? I love the changes of the leaves esp here at the foothills of the Blueridge Mountains in Virginia, hot drinks and comfort foods, and enjoying this time with my son! Ah, I wish that we were having leaves change here in Alabama! I'm planning a trip in November with my husband to Tennessee and I'm hoping we'll get some real Fall weather! I just LOVE all things Fall and everything Target has to offer. A new plaid blanket is on my wish list! I love the plaid one they have...they also have a fur throw that's on my wishlist! I am so happy it is fall, I've really been looking forward to it this year. I want to decorate my apartment for Fall! I've been trying to get in the Fall spirit to decorate our home...it's so hard when it's so hot out still! I just got that mug! I also love that throw, I think I'm going to get it! I can't wait to decorate for fall when I'm living in my own apartment next fall! It was so reasonably priced too, plus you can use it in your bedroom now and then definitely still use it in your own apartment next year! AH I LOVE TARGET! It makes me so so happy! Same here! I can't help but walk out with something every single time I go in! In love with those plaid picks! Plaid is seriously the best! Oooh, their plaid collection is amazing! Darn, I wish we had Target over here! You should try to order online! I love plaid on anything and everything! I love that pillow and throw! Great picks Jordyn! I'm in love with the monogram mug! So cute. I saw some really lovely ones in Urban Outfitters recently that I really wanted to get. Also where is the quote from that you used? It's lovely! All the plaid in Target has me dying!!! Love it ALL! It's so hard to choose just a few things! I love Target!! I wish they had one in Paris. I will definitely have to go check it out when I go visit! I went to Target last week and fell in love with their new arrivals! That horsehead is so fun... If only it went with my decor! I probably should stay out of Target as well...but I don't know if I'll be able to! I have to drive an hour to get to my nearest Target but it is SO worth the drive every couple of weeks! I have to drive a half hour, so I feel your pain! I'm definitely having to hold myself back from buying everything! I think my favorite thing about fall is boots, sweaters, and jackets. I hate cold weather, but have an obsession with all of these things (makes a lot of sense, right?) haha I also love the darker makeup looks! So much fun! I love the cozy clothes and the dark makeup as well...it's the upside to the chilly weather! Yay for fall and yay for Target! Two of my favorite things. My favorite thing about fall are the scents. I love fall-scented candles. I also love pumpkin-flavored things. I had a pumpkin-flavored scone yesterday, and it was so delicious. Oh my gosh, give me all the pumpkin scented things! This fall decor is so pretty. I really want to own that tray. It would look so pretty to display in a living room, I may have to snag it for myself! Such great choices!! There's something about fall that is so cozy and exciting :) Also have to love plaid season! I just saw the plaid line at Target yesterday, it's super cute and I know I'm going to buy a ton of it! I can't wait to finally go check it out in stores tomorrow! I just love fall decor! All the plaid is perfect! That tartan tray is to die for! Wouldn't it look precious on a coffee table?! That wooden horse head is actually awesome! Target's great for weird finds like that. I'm also loving plaid EVERYTHING-- throws and pillows are a perfect touch for any cozy fall day or evening. Who knew Target had such cute things, oh wait, everyone knows that! I absolutely LOVE fall & Target, so obviously this post is perfect. I LOVE Target's fall line. I walked in the other day and was blown away. I want everything ASAP!